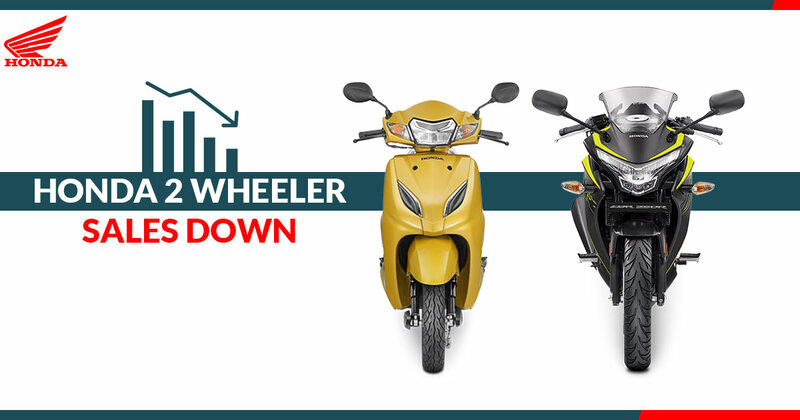 From the last few months, the Indian two-wheeler industry is facing a slowdown in the market. Even the prominent manufacturers ended FY 2018-19 seen a downturn in sales then HMSI is no exception. It registered sales of 55,20,000 units during the last fiscal which is 6.45 per cent lower than the decomposed units in FY 2017-18. If considered HMSI sales in March 2019 on the year-on-year basis, the Japanese giant witnessed a staggering downfall of 46.79% with 2,22,325 units as opposed to 4,17,380 units sales in March 2018. The worst ever recorded sales from the two-wheeler maker since its introduction on Indian soil. Earlier than this, in 2011/12, the company registered sales in the 2 lakh region. However, the month was similar- March 2012, but Honda managed to overtook Bajaj that time and designated self as the 2nd largest two-wheeler maker in India. The exact figures recorded were at 2.12 lakh units. The reasons behind this shocking YoY decline is not confirmed though which let the HMSI moved to the third spot in the month of March 2019 behind Hero MotoCorp and TVS. Also, there is a difference of just around 2,000 units between the sales of HMSI and placed at fourth position Bajaj Auto. Except for Bajaj Auto India, other two-wheeler OEMs in India including Honda has been struggling with the rising level of inventory at the dealership front in the last quarter of FY19. To handle the inventory buildup issue and improve liquidity at the dealerships, the Japanese automaker has made sort of changes in its production and dispatch operations. Currently, there is no way seems that the market will recover from this any time soon. Also, Honda is expected to continue with this decline in year-on-year numbers in April as well. But the question arises that would the company will be able to reduce the magnitude of fall? However, speculations suggest the period from April to June will see a quite rise in sales due to the marriage season but this year, the elections could turn out a deterring factor. Also, the launch of no new products in the last few months could also be considered among the reasons behind the brand’s poor performance last fiscal. However, Honda will continue to be the market leader in the automatic scooter segment. While the commuter motorcycle lineup did not succeed in pushing the market slowdown. The introduction of some new and interesting offerings in the segment could only help the Japanese bike maker. FYI, the Honda Activa 6G is under development. It would be interesting to see if HMSI would be able to earn its lost second rank in the market in the coming months.